The coyote is a member of the dog family native to North America, similar in appearance to a medium size shepherd. They weigh between 20 and 30 pounds, have pointed ears, a narrow muzzle, and bushy tail. Males tend to be larger than females. Their thick coat is grayish in color, with reddish tinges to the legs and ears, and a lighter-colored belly and nape. Coyotes have yellow eyes which reflect as greenish-gold at night. Coyotes occur in nearly all types of habitat, including some urban and suburban areas. They are most abundant in areas with a mixture of farmland, woodland, and grassland. Coyotes are susceptible to many of the same ailments as domestic dogs. viral disease that affects the respiratory, gastrointestinal, and central nervous systems. It is possible for humans to contract an asymptomatic (subclinical) CDV infection. Anyone who’s been immunized against measles (a related virus) is protected against CDV as well. Mange – Another common coyote disease, Mange is caused by a small mite which burrows into the skin, causing an irritation. This disease is extremely contagious, affecting as much as 70% of the coyote population. Mange mites can infect humans, but the symptoms are usually mild, consisting of a rash near the infected area. Heartworm – infection is a fairly common disease caused by parasitic worms living in the arteries of the lungs and heart of coyotes. In rare instances humans have also contracted this serious and potentially fatal disease. Rabies – is an acute, fatal encephalomyelitis caused by neurotropic viruses. It is almost always transmitted by an animal bite that inoculates the virus into wounds. Any coyote bite or scratch should receive prompt local treatment by thorough cleansing of the wound with copious amounts of soap and water; this local treatment will significantly reduce the risk of rabies. Anyone who may have been exposed to rabies should be advised to always contact local health authorities immediately for advice about how to deal with their exposure and should also contact their personal physician as soon as possible. Coyotes can cause substantial damage. In rural areas they oftentimes kill sheep, calves, and poultry. In some parts of the state they cause damage to drip irrigation systems by biting holes in the pipe. In other areas they cause considerable damage to watermelons, citrus fruits, and avocados. Aircraft safety is often jeopardized when coyotes take up residence on or near runways. Coyotes have also been known to prey on various endangered/ threatened species. In urban and suburban areas, coyotes commonly prey on domestic house cats, small dogs, poultry, and other domestic animals. Another issue is livestock depredation on many ranches against cattle and sheep. Coyotes have been known to attack humans and attacks are becoming more and more prevalent. In one case, a three year old girl was killed by a coyote in southern California. Most problems caused by coyotes can be solved by targeting and removing the specific coyotes that are responsible for the problems. Many times only one or a few coyotes need to be dealt with. If you have been experiencing coyote damage, the most effective approach is to use a combination of capture/removal and exclusion/preventative measures. Fencing and using guard animals are a suitable form of prevention, however if a coyote has established itself and is causing damage or are threatening human health and safety, it may need to be removed. Generally speaking, coyotes can and do cause many nuisance problems in city and suburban areas. However, if a coyote has lost it’s fear of humans and is exhibiting threatening behavior, removing the problem coyote may be the only recourse. The coyote’s economic importance and it’s role in nature should be considered in any evaluation of the animal. 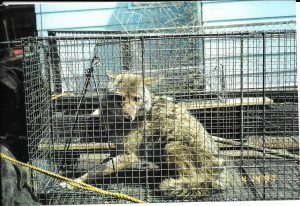 Coyotes can be captured using a variety of restraining devices or hunted where legal and appropriate. An Animal Damage Control (ADC) professional can help decide what will work best for your particular wildlife damage situation. Animal Damage Control (ADC) has been under contract with several cities removing problem coyotes with great success.